Offered to guests at the Sonesta Bayfront Hotel in Miami, this ice cold, infused water was the best thing that I have tasted in a long time. 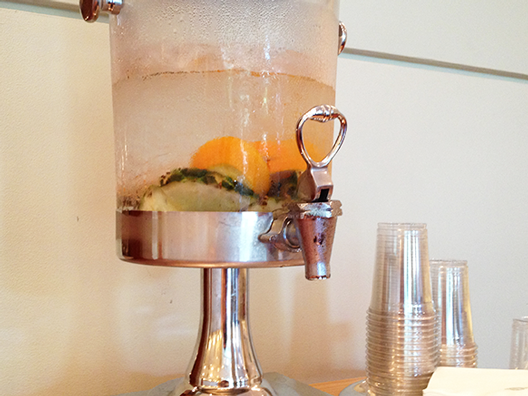 The water is served in a gorgeous Eastern Tabletop Two Gallon Dispenser. If you are serving infused water at a wedding or event, this stainless steel dispenser makes your water taste better just by looking so good! Recipe for a 2-gallon dispenser: 1/2 pineapple, quartered + 1 orange, sliced with peel on. Fill with ice and water. For the best flavor, infuse for 2 hours before serving. And when the mixture runs down to the halfway point of the dispenser, simply fill with more ice and water. You can infuse up to three times. Tip: be sure to layer your pineapple on the bottom of the dispenser. Pineapple is more solid than sliced orange, and will not clog your dispenser for this reason. If you are making this infused water in a smaller container such as a water bottle, try using one pineapple spear + 1 thick orange slice, cut in half. Enjoy this special water all summer long! It is so refreshing with ice. You’ll love it. Hi, Joanne. Infuser bottles can’t fit much, so I would try a 1″ x 3″ spear of pineapple and half an orange slice. Let us know how it turns out! Does it taste better if you let it sit for a few hours before serving? I was thinking of doing it overnight before serving the next day. Please let me know what is the best to give it the best taste. Try to infuse for two hours to get the most pineapple flavor. The orange flavor will be released almost right away, but the pineapple juices take longer to seep out. HUGE HIT! I served this at an afternoon funeral visitation at my church. There were cookies to eat and coffee and water to drink. This was the perfect water to add a little flavor, but not too festive, and helped offset the super-sweet cookie effect. It was very well received, much better than “church punch”. Do you leave the water out of the fridge for several hours with the pineapple in it? Can you leave it out of the fridge for several days if you don’t drink it all? Can you eat the fruit or is it not good for you after this? Hi, made this one myself last night. 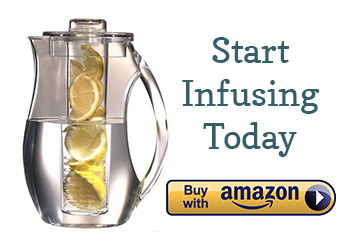 It was my first time in infusing orange and pineapple, so I searched for an orange and pineapple infused water recipe if it’s a perfect blend. I saw this and wondered, is it okay to add up some honey? I added a spoonful of honey. Is that okay?